On May 15, 1972, Alabama’s controversial governor George Wallace was shot at close range during an outdoor rally in Laurel, Maryland. The assailant, clad in red, white and blue, was arrested immediately at the scene. The 52-year-old Wallace was campaigning in his third bid for the U.S. presidency and was speaking before a crowd of a thousand people. While shaking hands with well-wishers following his speech, Wallace was hit by two bullets that struck his stomach and chest. Three other people were also injured in the attack. The Governor was rushed to Holy Cross Hospital in Silver Spring where he underwent five hours of surgery. He survived the ordeal, but Wallace would be permanently paralyzed from the waist down for the rest of his life. Although he won the primaries in both Michigan and Maryland before the anesthesia had worn off, the seven months he spent in the hospital recuperating made it necessary for him to abandon his presidential campaign. Wallace’s political career was one of the most controversial – and changeable – in U.S. history. He won the governor’s seat in Alabama running under a segregationist platform in 1962, promising his white constituents, “Segregation now! Segregation tomorrow! Segregation forever!” Only six months later, he was forced to renege on his promise and allow black students to enroll at the University of Alabama because of pressure from the federal government. 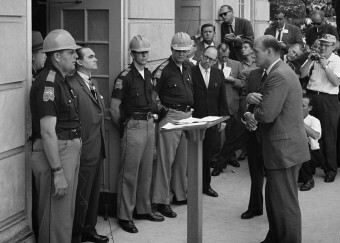 The Governor became the national poster boy for resistance to the Civil Rights movement. He lost most of the Democratic presidential primaries he entered in 1964; but the fact that he had any success on a national scale at all was an unsettling indication of the backlash against integration. He ran as an Independent candidate in 1968 and made a strong enough showing to get on the ballot in all 50 states. He garnered 10 million votes on Election Day, a very respectable number. By the time he ran yet again in 1972, this time as a Democrat, Wallace’s platform was a bit more moderate than in days past. His campaign was showing great promise – until a 21-year-old man named Arthur Bremer burst from the crowd yelling “’Hey George! Hey George!” and pumped several bullets into his midsection. Wallace ran for president a fourth and final time in 1979, but his political career had lost momentum after 1972. By this time, he’d also had a complete change of heart pertaining to his past stance on race relations. He reached out to Civil Rights leaders he’d so bitterly opposed not long before to ask their forgiveness. Luckily for him, Alabama’s African-American community showed Wallace more understanding and kindness than he had shown them back in the 1960s, and with their support he was re-elected as Alabama’s governor in 1983. To his credit, Governor Wallace appointed more African-Americans to political office than anyone else in Alabama’s history. George Wallace retired from politics in 1986, and died in 1998.